A stroll down memory lane, reminiscing about the early years of the Big Fundamental. In order to honor the day set aside to honor Big Fun, I thought I’d present a flashback to the heat he used to put on his feet in his early years in the league. 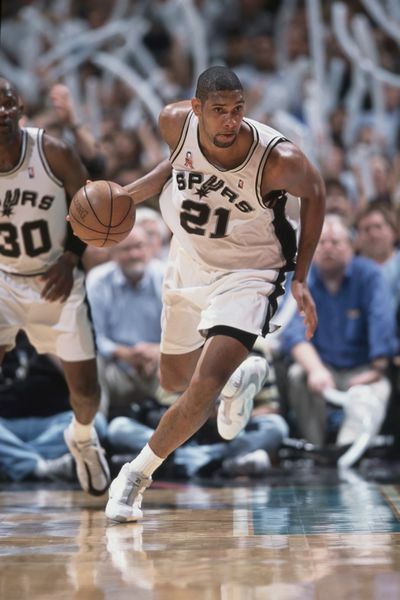 Even though we became accustomed to Duncan rocking the three stripes, he was originally signed to the swoosh. He made the transition to Adidas in 2003, but today’s focus is on his time with Nike (’97-’02). Here are the top five kicks he rocked as a rookie and beyond. I honestly have no idea what Nike was thinking when they designed the first signature sneaker for the greatest power forward of all time. It looks like a sneaker for Spider-Man. Now that I think about it, the Tobey Maguire-led Spider-Man trilogy began on May 3rd, 2002 and if you take into account the time it took them to film the first movie… never mind, it’s probably just a coincidence. Then again, Tim is an avid comic enthusiast. Could he have possibly asked to have his first shoe be an homage to the web slinger? Conspiracies have been built around less. Major upgrade. Maybe the designers’ careers were on the line this go around, but this is a terrific look. Sporting a simple design, the Duncan II’s are less bulky than their predecessor. In Duncan fashion, the shoes were sleek and smooth, but not too flashy. The Duncan II’s became an iconic shoe after Timmy won his 2001-02 MVP trophy. This iconic still photo is reason enough to place these shoes on the list. The Viz Zoom Uptempo originally debuted in 1999, the year the Larry O’Brien trophy was delivered to the city of San Antonio as the Spurs won their first ever NBA Championship. Throughout the run, Duncan could be seen wearing a player exclusive white and black colorway (zoom in here for a closer look) as he led the Spurs to the promised land while averaging a dominant 23.2 points, 11.5 rebounds, 2.8 assists, 2.6 blocks. One of the first sneakers he wore as a pro, these were an instant classic. I consider these the unofficial signature sneaker of the Big Fundamental. The Foamposite was a bold shoe, and Duncan wanted to be the first to rock them. Timmy was selective with what he wore. Each shoe had to make a statement, and the Foamposite was the first of its kind. Everything from the construction of shoe to the aesthetic was different. 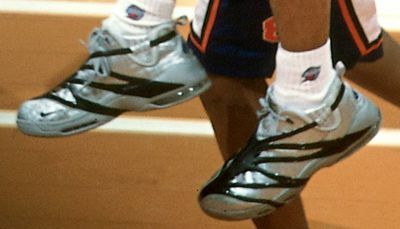 Duncan was seen in these during 1998 playoffs, and at the start of the 1998-1999 NBA season. Just look at these. Easily the best sneaker TD ever laced up, in my opinion. The Pearls were released in 1997 and were coveted by Duncan’s fans. In fact, if Timmy had decided to wear these with his 2015 Christmas uniform, he would’ve been beyond clean. I mean, Mr. Clean would’ve had a major case of clean-envy. Clenvy? You may recall these making a cameo in the classic hoops film “He Got Game” in 1998, which might be why Timmy would want to wear them. 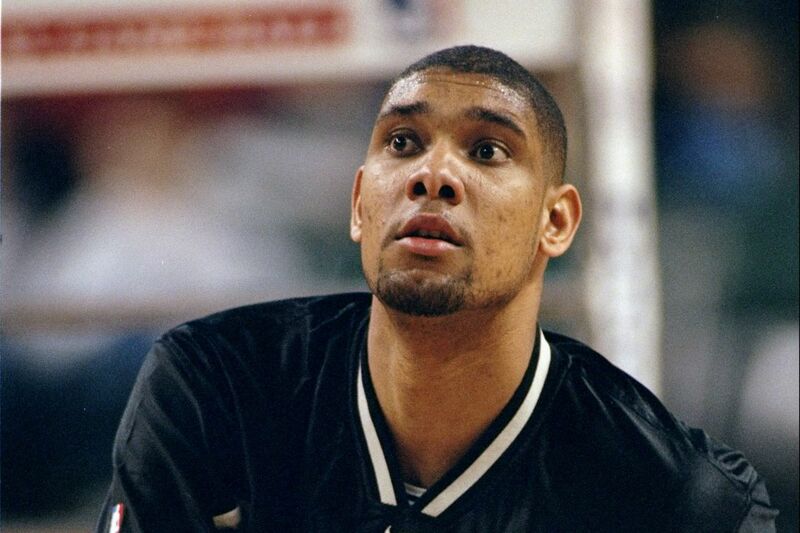 After being selected first overall in the 1997 NBA draft, Duncan’s play proved he was a premiere PF in the league, earning him his first selection to an All Star game in 1998 as a rookie. 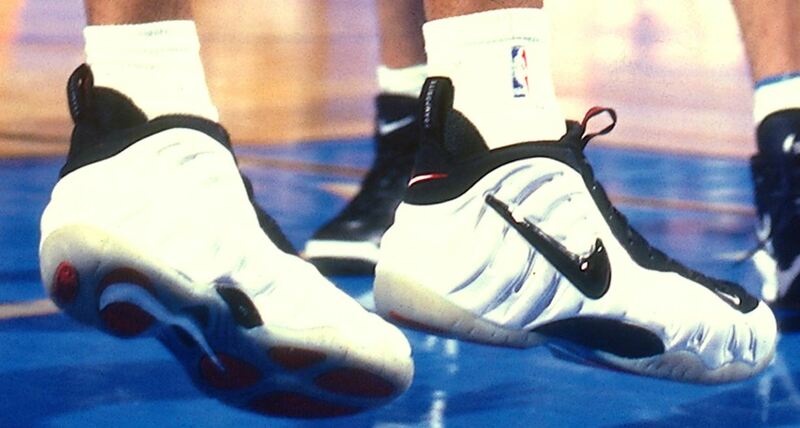 Timmy wore the Foamposite Pearls for the majority of his rookie campaign which ended with Rookie of the Year honors. TD paid tribute to another GOAT once upon a time. In 1998, after Michael Jordan retired for the second time following his second three-peat, Duncan donned the Jordan 14 Oxidized Green. I never imagined I’d see one of my favorite players rocking a pair of my other favorite player’s signature sneaker. Timmy really was for the culture.